What changes make the 2017 Jeep Cherokee different? Extra standard equipment at no extra cost, including xenon headlamps on all but the entry-level model and luxury upgrades for the popular Trailhawk version. Jeep’s largess is intended to boost the appeal of a compact crossover on the verge of bigger changes for model-year 2018. The basics are unchanged, with a roomy five-seat cabin, good road manners, a choice of front- or all-wheel-drive, and one of only two lineups in the class to offer both four- and six-cylinder engines. Because the ’17 changes strengthen another Cherokee trait: no rival matches its bandwidth. There’s a Cherokee for nearly every want and wallet, and that’s help make this the top-selling Jeep. The 2017 lineup ranges from the highly affordable front-wheel-drive base Sport model to the upscale Overland, and takes an adventurous detour to serious off-roading with the Trailhawk. The broad range of available features stands out in this segment and includes automatic self-parking and best-in-class 4,500-pound towing ability. Styling revisions are coming for model-year ’18, but they won’t alter the understructure or central body shape. The two main engine choices will carry over, as well. And the value equation should tilt in your favor as the model year progresses as Jeep and its dealers offer tempting incentives to clear inventories ahead of the facelifted ’18. If you want to experience the first major changes to this crossover since its model-year 2014 introduction. Expect revisions to nose and tail, maybe a revamped interior, and possible addition of a turbocharged four-cylinder-engine option. Waiting gets you the looks and technology that’ll carry Cherokee to its next full redesign, likely for model year 2019 or ’20. Finally, resale value will likely be higher on the ’18 versus the suddenly dated-looking ’17, and that would compensate for some of the inevitable model-year price inflation. No. The ’17 Cherokee is a visual rerun, retaining the pointy prow and squinty-light design that was controversial back in ‘14 but helped distinguish this Jeep in the crowded compact-crossover category. Interestingly, those characterful, narrow lights in the upper fenders are the turn-signals and running lights. The headlamps are behind the rectangular lenses below. For ’17, they’re upgraded to xenon lighting on all but the Sport model. The Sport is again the first rung on this tall model ladder. Accounting for about 10 percent of sales, it returns with such exterior identifiers as black door handles and mirrors and sliver-painted 17-inch steel wheels. Dressing up the Sport trim is the Altitude grade. It adds 18-inch gloss-black alloy wheels with matching exterior accents, plus deeper-tint windows. Next up is the Latitude with such touches as fog lamps and 17-inch alloy wheels. 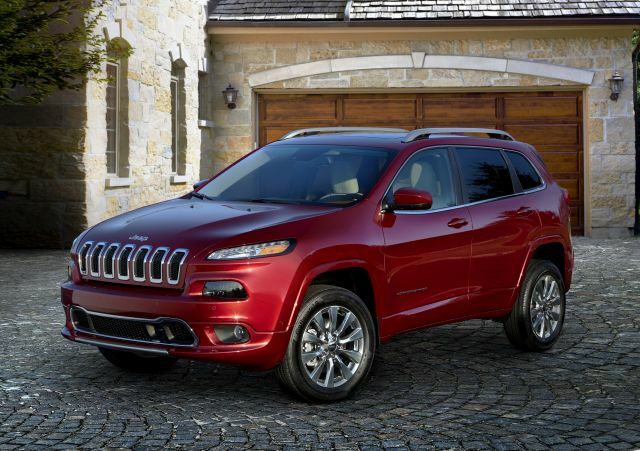 It accounts for about 45 percent of Cherokee sales. Above that is the Limited with lower-body brightwork, mirrors with integrated turn signals, and 18-inch alloys. About 25 percent of Cherokee buyers choose a Limited and if they want it with trendy black wheels and accents, they can order the High Altitude edition. A favorite of about 5 percent of Cherokee shoppers, the luxury-oriented Overland concentrates on interior upgrades while also adding bi-xenon headlamps and polished 18-inch alloy wheels. The off-road-specialized Trailhawk slots in price between the Limited and High Altitude. It accounts for about 15 percent of sales but has come to symbolize Cherokee’s go-anywhere Jeep DNA. Those genes are represented by exterior styling exclusives like red front tow hooks, grille and mirror accents, a matte black hood decal, flared wheel openings, and unique 17-inch polished alloy wheels. Every Cherokee has a straightforward dashboard design tarnished only by some controls mounted a bit low. Passenger space is among best in class, though cargo volume is subpar. None. Just over half of buyers choose the V-6 and about 60 percent order a Cherokee with one of its three available all-wheel drive (AWD) systems. A nine-speed automatic is the sole transmission. The four-cylinder is standard on all but the Overland. It’s a 2.4-liter with 184 horsepower and 171 pound-feet of torque. That’s just slightly greater output than most base four-cylinders in this class. But Cherokee is also the heaviest crossover in the competitive set, so four-cylinder versions can feel underpowered when you want to accelerate quickly. Unhelpful is the transmission’s syrupy and often tardy shifting. With 271 horses and 239 pound-feet of torque, the 3.2-liter V-6 is the wiser choice and the only one for Overland buyers. Some rivals offer turbocharged four-cylinders with more muscle, but this six delivers power more linearly and counteracts some of the transmission’s bad habits. Front-wheel drive is standard on all but the Trailhawk, but traction in snow and on loose surfaces is best with one of the three available AWD systems. Jeep’s Active Drive I is optional on Sport, Latitude, and Limited models. It’s a basic AWD system that normally operates in front drive and automatically shuffles power fore and aft to quell tire slip. 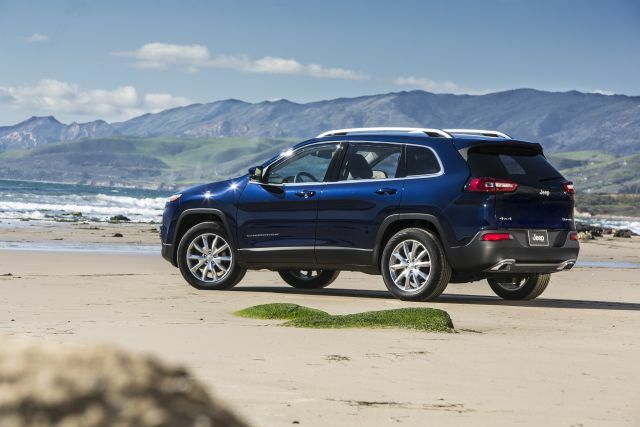 Like all Cherokee AWD setups, it comes with the Jeep’s Selec-Terrain, allowing drivers to dial in optimal powertrain calibrations for snow; sand, mud, and rock; and sporty on-road driving. Active Drive II is optional on Latitude, Limited, and Overland. It also automatically shuffles power but includes low-range gearing to greatly enhance off-road traction. A fortified version, called Active Drive Lock is standard on Trailhawk. It adds a locking rear differential for maximum off-pavement traction. The Active Drive systems create a crossover unmatched in the class for off-road ability (although, surprisingly, a Subaru Forester with X-Mode gives it a run). On-road handling isn’t quite as sharp as that of the segment-leading Ford Escape and Mazda CX-5, but the Jeep has a pleasant manner that makes it an inviting and confident drive in any circumstance. That composure is balanced with above-average ride quality, a blend that can be traced to European-level chassis tuning input from Fiat, which controls Jeep and the Chrysler, Ram, and Dodge brands. EPA mileage ratings actually decrease by 1 mpg for some powertrain combinations but that’s a reflection of new testing measures designed to more accurately reflect real-world driving. Regardless, fuel-economy ratings remain below midpack for the class, a consequence of Cherokee’s above-average weight and below-average powertrain efficiency. This despite the ability of Active Drive I to fully disconnect the rear axle when in front-drive and the V-6’s ability to shut down when the vehicle is stopped and automatically restart when the driver releases the brake pedal. Four-cylinder Cherokees rate 21/30/25 mpg city/highway/combined with front-wheel drive and 21/28/23 with Active Drive I. Those with Active Drive II rate 21/27/23 mpg. The four-cylinder Trailhawk rates 19/25/22. V-6 Cherokees rate 21/29/24 mpg city/highway/combined with front-wheel drive and 20/27/23 with Active Drive I. Those with Active Drive II rate 18/26/21 mpg. The V-6 Trailhawk rates 18/24/21. While all but the Sport now come with xenon headlamps, Cherokee’s 2017 equipment upgrades are centered on the Trailhawk. Jeep essentially makes a previous $1,495 option standard, so Trailhawk’s base price now includes heated and ventilated front seats covered in Nappa leather, a power eight-way driver seat, and a heated steering wheel. All ’17 Cherokees have a 60/40 split/reclining rear seat, cruise control, electric parking brake, USB charging, and rear-seat heat ducts. The Sport Altitude is the Sport in trendy duds, while the Latitude includes such features as ambient LED interior lighting, one-touch up and down power front windows, fog lamps, side roof rails, leather-wrapped steering wheel with audio controls, rearview camera, automatic headlamps, and a nifty storage bin beneath a hinged front passenger-seat cushion. The Limited and its flashier High Altitude edition build on that with leather upholstery; an 8.4-inch dashboard touchscreen (up from 5.0); heated mirrors, front seats, and steering wheel; windshield wiper de-icer; power driver’s seat; remote engine start; pushbutton ignition; automatic dual-zone climate control; automatic dimming rearview mirror; and illuminated front cupholders. The Overland model was added during the ’16 model year as Cherokee’s on-road flagship and continues for ’17 with such standard features as a steering wheel with Zebrano wood trim, heated and cooled Nappa leather power front seats, memory driver’s seat, Berber floor mats, Alpine Premium audio. It also comes with Jeep’s full infotainment suite, including imbedded navigation with the 8.4-inch screen. Navigation is $1,195 option on Latitude, Limited, and Trailhawk and unavailable on Sport. The Overland is available with an optional Heavy Duty Protection Group with underbody skid plates. And it comes with the power liftgate that’s available at extra cost on all but the Sport. Standard on Overland and optional on all but the Sport is a package that includes blind spot monitoring, rear-obstacle and rear cross-traffic detection, and power folding heated mirrors with integrated turn signals. The package costs $1,095-$1,155, depending on model. Even Overland buyers need to pay extra for Cherokee’s most complete safety kit. A $1,645 option also available on Limited and Trailhawk, the Technology Group includes forward-collision warning with automatic braking that will slow but not stop the Cherokee to mitigate a frontal collision. Also included are sensors that can stop it if you’re about to back into an obstacle. In the package as well is automatic steering to counteract unintended lane departure, adaptive cruise control that can maintain a set distance from traffic ahead and — via its low-speed stop-and-go function — allow you to crawl along in bumper-to-bumper traffic without operating brake or throttle. It also includes automatic high-beam headlamp dimming and automatic parallel and perpendicular self-parking. It adds a sunroof, and on the convenience side, a wireless smartphone charging pad. Base prices increase very modestly: less than $300 on most models. Prices throughout the Cherokee line are competitive with similarly positioned rivals, although nothing else in this class quite matches the Overland for poshness or price – yet. Base prices here include Jeep’s $995 destination fee. With the four-cylinder engine, 2017 Cherokee base prices are: Sport, $24,590 with front-wheel drive and $26,590 with all-wheel drive; Altitude, $25,585 front-drive and $28,540 AWD; Latitude, $26,540 and $28,540; Limited, $30,490 and $32,490; High Altitude, $31,485 and $33,485. The four-cylinder Trailhawk comes only with AWD and starts at $32,190. With the V-6, ‘17 Cherokee base prices are: Sport, $26,335 with front-wheel drive and $28,335 with all-wheel drive; Altitude, $27,330 front-drive and $29,330 AWD; Latitude, $28,295 and $30,295; Limited, $32,335 and $34,235; and High Altitude, $31,485 and $33,485. The V-6 Trailhawk comes only with AWD and starts at $33,935. The Overland comes only with the V-6 and is priced from $37,635 with front-wheel drive and from $39,590 with AWD. Release date for the 2017 Cherokee release is autumn 2016. Hyundai Tucson, which has less-refined engines and less room inside; Nissan Rogue, a poorer handler with a lily-livered powertrain; and Volkswagen Tiguan, which is outdated, overpriced, and undersized. Honda CR-V, which is by no means an off-roader but is the best all-round execution of a compact crossover; Ford Escape, aging but appealing for road manners and turbocharged engines; Mazda CX-5, the sportiest-driving entry in the class, and maybe best-looking, too. A good turbo four-cylinder would fit current compact-crossover thinking better than the V-6. Some fans hope for a four-cylinder diesel option. We’d settle for a steadfast transmission. With shift action ranging from slurred too abrupt, FCA’s nine-speed automatic continues to behave like a work in progress.